UO Chemistry and Biochemistry graduate student Andrew Wagner has been awarded a 2015 American Heart Association Predoctoral Fellowship. The $50,000 award will be distributed over two years, and is intended to help students initiate careers in cardiovascular and stroke research by providing research assistance and training. Research topics may be broadly related to cardiovascular function and disease and stroke, or to related clinical, basic science, bioengineering or biotechnology, and public health problems, including multidisciplinary efforts. Andrew earned his BA in Biochemistry in 2011at Colorado College in Colorado Springs, CO., and entered the UO Chemistry doctoral program in the fall of that year. 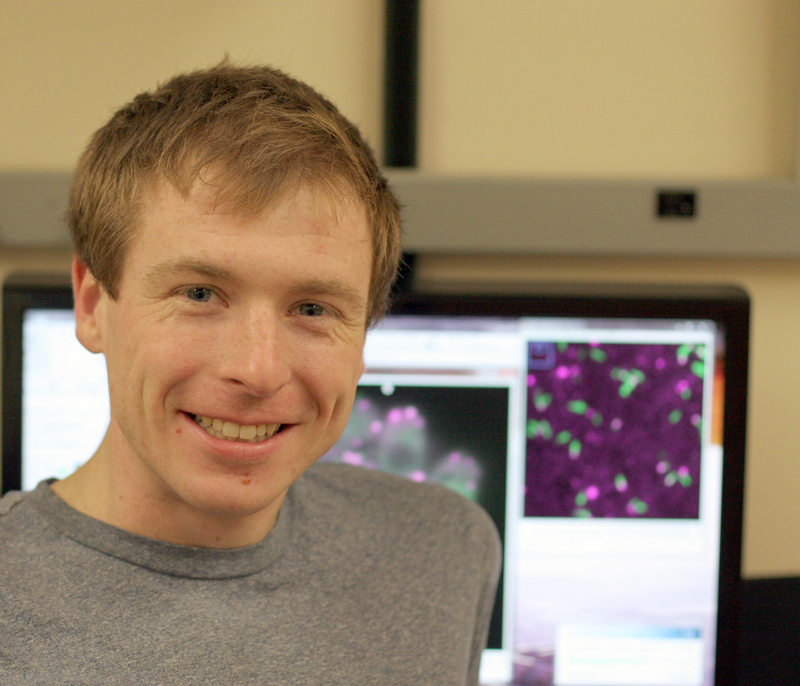 He is currently doing his thesis work in the Nolen lab, and his proposal, “WISH/DIP1/SPIN90 (WDS) Proteins Seed Assembly of Branched Actin Networks,” was selected for funding by the AHA. His research is focused on investigating the regulation of the actin cytoskeleton, a protein framework that provides a physical scaffold for cells. Actin molecules polymerize into helical filaments that undergo dynamic rearrangements to allow changes in cell shape during motility and provide tracks for material transport. Striated tracks of actin filaments play a fundamental role in muscle contraction like those of the heart. After completing his PhD, Andrew plans to continue to lead a research driven career investigating mechanisms in biochemistry and cell biology in diseased and non-diseased states.